Glass thermometer is manufactured through a dozen procedures, such as artificial firing, liquid filling and so forth. It chooses round or triangular rod glass as raw material, mercury or organic solution as the temperature sensing liquid, such as kerosene, alcohol and so on. Glass thermometer features low price, accurate measurement, convenient use and no need for external power. It's widely used in daily life and production line, especially marine industry. Connection of Glass thermometer: Straight, 900 angle, 1350 angled, 1/2"
Exact Instrument Co., Ltd is a professional manufacturer and supplier of glass thermometer, pressure gauge in China. Our company can offer Glass thermome ter OEM business according to clients' requirements. 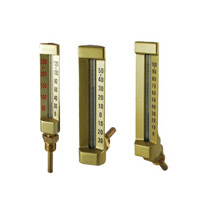 Hot Water ThermometerThe material of hot water thermometer is mainly copper and iron. It has its temperature sensor. Hot water thermometer is mainly used to measure water temperature. It's applicable for HVAC service.